Self-made businessman CY Leung has been chosen as Hong Kong's new leader after an unusually turbulent campaign. He was elected by a committee of 1,200 business leaders and other influential citizens, mostly loyal to Beijing. The Chinese government switched its support to Mr Leung late in the campaign after a string of scandals rocked early frontrunner Henry Tang. Hundreds of pro-democracy protesters gathered outside the convention centre where the vote took place. The tumultuous campaign has fuelled calls by pro-democracy activists for Hong Kong's 7.1 million residents to be able to directly elect their own leader, something China has promised will happen in 2017. 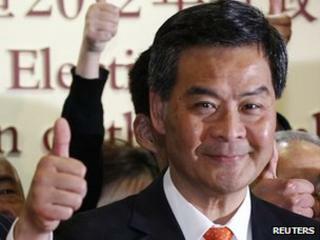 Mr Leung, 57, was declared Hong Kong's new chief executive after securing 689 votes. With most of the votes counted, Henry Tang had 285 and pro-democracy candidate Albert Ho 76, election officials said. Before the vote, Mr Leung had told reporters he would work hard to "get rid of people's negative perception about this election". The son of a policeman, he had originally been seen as having only an outside chance of securing the leadership. But Beijing's early choice, Mr Tang, was wounded by a series of gaffes and scandals. The heir to a textile fortune confessed to cheating on his wife and building an illegal underground basement, which was reported to have housed an entertainment suite, jacuzzi and wine cellar. Mr Ho's outspoken pro-democracy stance meant he was widely seen as being unacceptable to Beijing. Mr Leung will replace Donald Tsang, who served two terms and could not run for the post again. Hong Kong, a British colony until 1997, has been enjoying high degree of autonomy from Beijing. But Communist leaders in Beijing have resisted public pressure for full democracy in Hong Kong.